Brown stink bug is the primary pest species of corn in North Carolina, although brown marmorated stink bug, green stink bug and southern green stink bug can also be pests. They feed through piercing sucking mouthparts and can cause three distinct types of damage. Early vegetative stages (V1 to V6)- plants can be stunted, yield-robbing tillers can be formed, or plants can be killed. 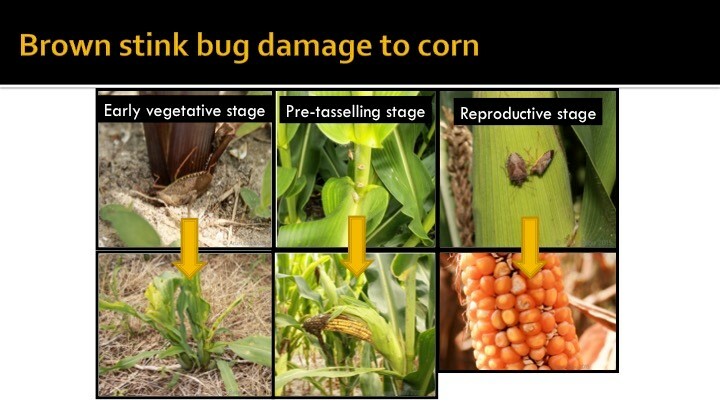 This damage can easily be confused with billbug damage. Pre-tasselling stage (V14 to VT)- ears can be crooked (banana ear) and kernels can be missing. This damage can easily be confused with damage from moisture or nutrient stress. 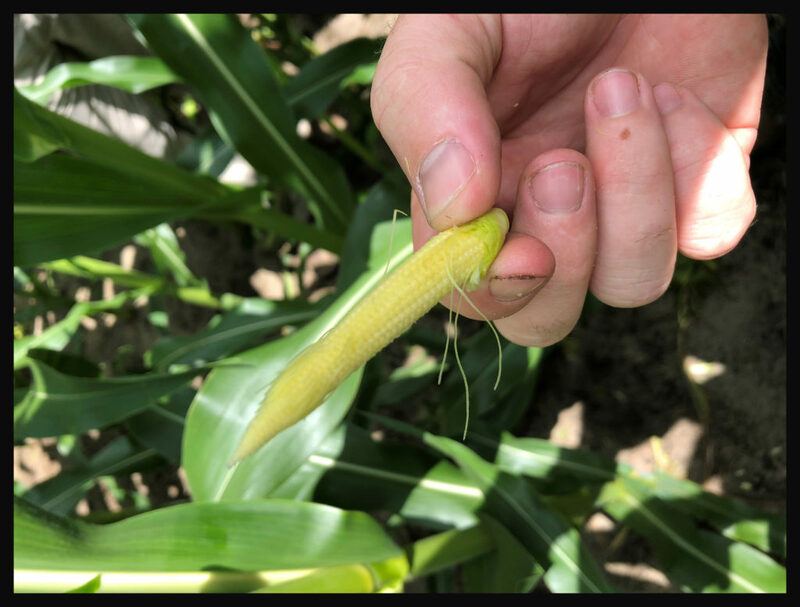 Reproductive stage (R1 to R4)- kernel size and weight can be reduced and secondary pathogens can be introduced that lead to aflatoxin or fumonisin contamination. Where can stink bugs be a problem? Corn fields planted in no-till fields with heavy cover. Watch for feeding in open-furrows. Wheat-corn interfaces. Stink bugs aren’t a pest of wheat, but will feed on wheat up to the time of harvest. Wheat harvest can push stink bugs into nearby corn, but this isn’t a guarantee. Corn fields planted behind soybeans. Stink bugs build up in soybeans during the late summer and early fall after other crops are harvested. Check field edges near woods, where stink bugs may have overwintered after building up in last year’s soybeans. Scouting. Scout corn for stink bugs from V1 through R4. Check all edges first, since they concentrate toward edges and not field middles. The number of sampling stops will depend on the number of stink bugs present and field size. At each sampling stop, check at least 10 corn plants. Sampling the entire plant is not necessary. From V1 to V6, scout the base of the plant on the stalk below the lowest green leaf. From V14 to VT, find where the primary ear is located or peel back leaves to find where it is forming. Scout the stalk from the first leaf above and below the primary ear. 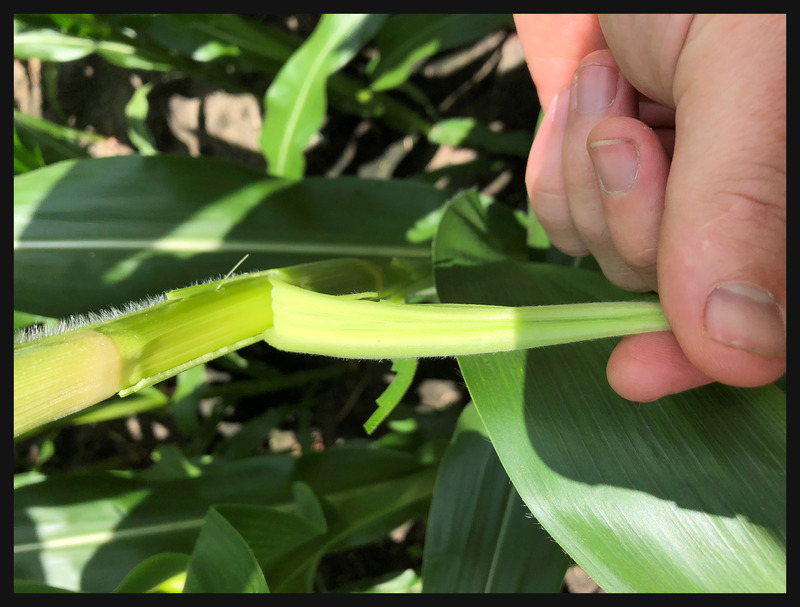 From R1 to R4, scout the stalk at one leaf above and two leaves below the primary ear. Thresholds. Thresholds vary depending on stink bug pressure and are based on a 100 plant sample as described below (see table). These thresholds are not percentages, but numbers. If a single plant has multiple stink bugs, this must be counted into the total. If the number of stink bugs exceeds the number in the “treat” category, treat the field even if 100 plants have not been sampled. If the number per plant falls between the “treat” and “do not treat” category, take more samples until a confident decision can be made. Insecticide control. Many insecticides in the organophosphate and pyrethroid class are effective for brown stink bug in corn. However, bifenthrin is the most effective both because it can be applied at a rate that contains more active ingredient than other pyrethroids and because it is more toxic to brown stink bugs. Expect only a week residual. Coverage- deliver insecticide where the stink bugs are located (photo below). Ensure canopy penetration with proper nozzle, pressure and volume selection. Timing- the most critical time to treat from V14 to VT is just before the primary ear is exposed. 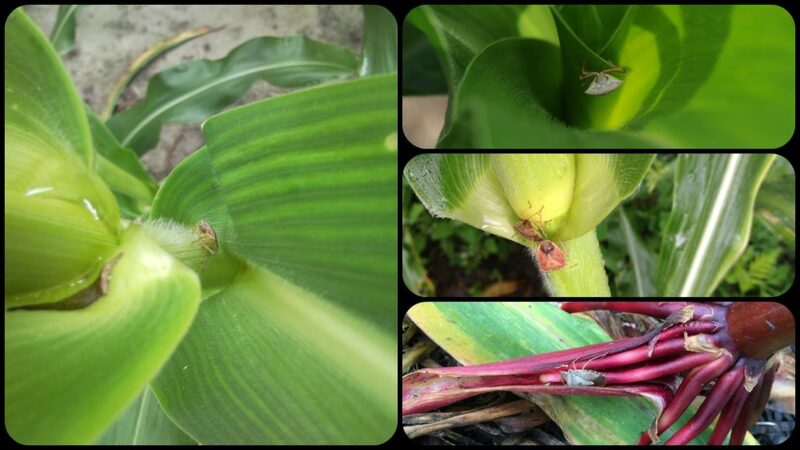 Aim to control stink bugs when the primary ear is between these stages, but preferably on the early side to avoid banana ear.